Observation - Jonathan - Bracket fungus - 22nd November 2008 - UK and Ireland. Description: A fungus growing on a pine tree stump. Can someone tell me what this is? I couldn't make it out using my fungus book. 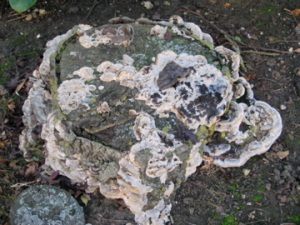 A fungus growing on a pine tree stump. Can someone tell me what this is? I couldn't make it out using my fungus book.